seven + one = Required Please enter the correct value. Wal-Mart Stores Inc. (NYSE:WMT) is ditching its most well-known pricing strategy in an effort to compete with e-commerce leviathan Amazon.com Inc. (Nasdaq: AMZN). To encourage consumers to use Wal-Mart's app and online store to shop for merchandise, the company has decided to eliminate its price-matching policy at over 800 of its 5,000 stores nationwide – and plans to expand the same strategy company-wide. Wal-Mart spokesperson John Forrest Ales told Retail Dive last year that the price-matching policy is ending mostly because the retailer is confident that it already has the lowest prices. Yet consumers are not pleased with the change. "I complained about them stopping their price-matching… I will just go to the other stores now to buy the items," one Facebook user said in August 2016, when Wal-Mart first began to roll out the change. "I'm finding that Wal-Mart is no longer the value it used to be," said another user. With the old price-match program, Wal-Mart shoppers could simply show a competitor's ad selling an item for less during checkout and pay that ad's price. Now, customers have to go through a tedious, multi-step process. This is because Wal-Mart is desperate to find a way to compete with rival Amazon. And in order to do that, it needs something Amazon has in spades: consumer data. 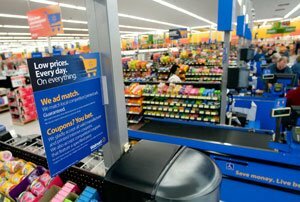 In other words, instead of just lowering the price at the register to save you money in one simple step, Wal-Mart now makes customers go through a six-step process just to "give" you money that you can only spend at Wal-Mart. This keeps the "savings" dollars at Wal-Mart and ensures the company has access to valuable information on shoppers' spending habits and in-store purchase decisions. At the same time Wal-Mart is taking away its price-match policy, other retailers are offering it for the first time. Target Corp. (NYSE: TGT), Bed Bath & Beyond Inc. (Nasdaq: BBBY), and Best Buy Co. Inc. (NYSE: BBY) all offer price-match guarantees on their merchandise. In fact, just last week, even online retailer eBay Inc. (Nasdaq: EBAY) announced that brand-new items on its deals page will qualify for a price-match guarantee. In short, Wal-Mart and the other retailers are changing the way they do business just to compete with the likes of Amazon. And although Wal-Mart has seriously frustrated its consumers, many companies have fared far worse at the hands of the e-commerce giant…. How to Profit from the "Retail Ice Age"
"Everyone shops – but thanks to the Internet (namely, Amazon), where and how we shop has changed in ways that none of us ever imagined," says Money Morning Capital Wave Strategist Shah Gilani. And our shopping behavior isn't the only thing that's changed. The list goes on… In fact, Shah's got his eye on dozens and dozens of other companies that are positioned to fail. "The truth is, there's a ton of money to be made on retail stocks – if you know what you're doing," said Shah. Will an Amazon Stock Split Happen in 2017?